An exhibition and auction of over 200 works on paper, showcasing the most exciting artists working today. In the exhibition, artists associated with the medium of drawing sit alongside those better known as sculptors or painters. Le Brun presents a drawing made for a commission by Royal Mint in 2006 for gold and silver bullion coins representing Britannia. Under the Night Sky explores the numerous ways in which the frontier of the night sky influences the human psyche and continues to hold artists in its grip. The exhibition brings together significant works by modern, post-war, contemporary artists and designers with a selection of seminal Central Asian rugs. The works in the exhibition engage with the night sky on both conscious and unconscious levels, featuring the interplay between literal homages to the night sky and works with looser interpretations of the theme, whose makers innately channel the emotive presence of night. Le Brun presents a new large oil painting. This solo exhibition will bring together new paintings and works on paper. These recent paintings in their handling, colour and visionary qualities affirm Le Brun's position in a line of English painters extending from Gainsborough and Turner, through Blake and Palmer, to Paul Nash, Ivon Hitchens and Patrick Heron. “Since the 1970s he has been producing paintings that defy categorisation but which are... possessed of an energy and drama at odds with the irony and theoretical baggage common to most British contemporary art.” Digby Warde-Aldam, The Week, July 2018. This exhibition will feature a large-scale installation from Le Brun’s current body of work, Doubles. This series of diptychs explores the idea of composition by juxtaposing independent paintings to achieve greater complexity of expression. For Le Brun, the process of painting itself involves an intrinsic duality: "cover, uncover, discover – this is the essence of painting’s truth." 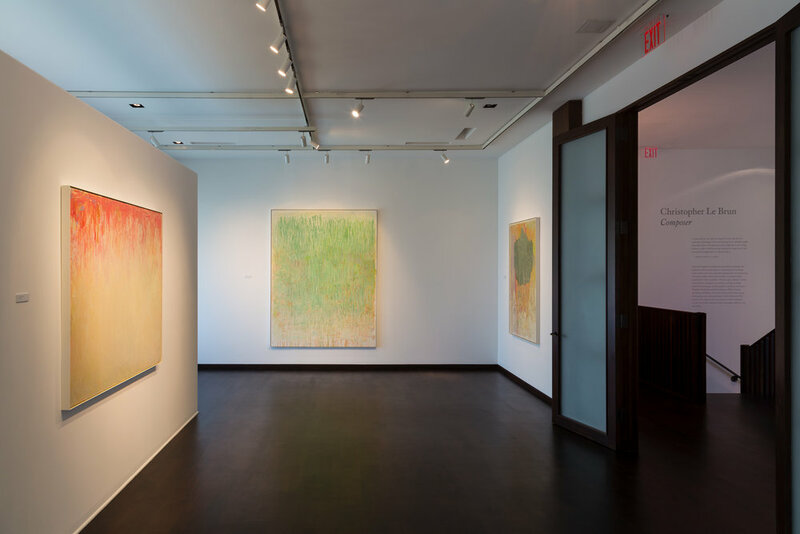 Christopher Le Brun’s first exhibition with Lisson Gallery features a series of arresting large-scale paintings produced over the past two years. A fully illustrated book published with an introduction by Lisson's founder Nicholas Logsdail and an essay by art historian Ben Street accompanies the show. Now available via Cornerhouse Publications. Each summer the RA galleries are jam-packed with contemporary art made by internationally renowned artists and exciting new talent. This year, the 250th Royal Academy Summer Exhibition, Grayson Perry RA and his committee of fellow artists have handpicked over 1,300 artworks in an array of mediums. As always, most of the art is for sale and purchases help raise money for the Academy’s non-profit-making activities, including educating the next generation of artists in the Royal Academy Schools. Le Brun is exhibiting a suite of four new woodcut prints, entitled Changing Light 2018, in the Sackler Galleries. Le Brun presents a new large-scale oil painting. A fully illustrated book accompanies the exhibition. This solo show is being held at Wolfson College of Cambridge University, which has an active programme of exhibitions in its non-gallery spaces every year. The show comprises fifteen new oil on paper paintings from a series entitled Doubles. These works represent a new mode of thinking about composition for the artist which resulted from painting directly onto the proofs of a recent print series, Composer 2017. At the private view on Saturday 12 May, the Mifune Tsuji Trio performed a musical response to the works. A fully illustrated book, Doubles, published by Ridinghouse, accompanies the exhibition with an essay exploring dualities across a number of disciplines by exhibition curator Dr Anna M Dempster. LOPF’s convivial atmosphere provides the perfect setting to engage with the 50 exhibitors, who offer a wealth of specialist knowledge for new and experienced collectors alike. Visitors to this fair can deepen their understanding and appreciation of original prints through LOPF’s daily programme of talks with artists and specialists. Le Brun presents a suite of four woodcut prints, Composer 2017. Including new prints by Christopher Le Brun, Norman Ackroyd, Stephen Chambers, Eileen Cooper, Anne Desmet, Paul Huxley, Chris Orr, Tom Phillips, Emma Stibbon, John Carter and Rebecca Salter, the exhibition in particular showcases work by Royal Academicians elected in the Printmaking category. Limited editions made on-site in the RA Schools by Grayson Perry RA and Allen Jones RA will also be exhibited. The works exhibited are available to buy online through Art Sales at the RA. 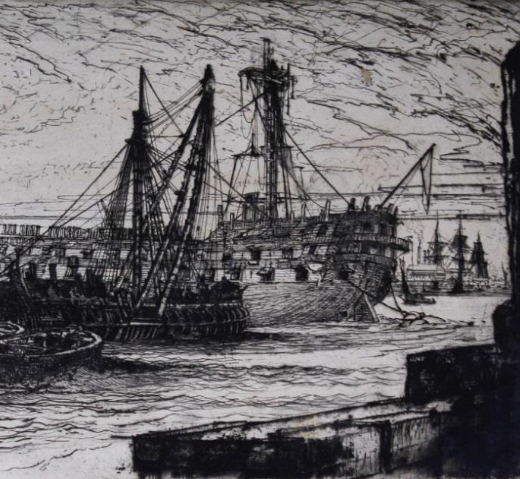 Print REbels celebrates the 200th anniversary of the birth of the founder of the Royal Society of Painter-Printmakers, Sir Francis Seymour Haden (RE). A prestigious collection of works has been brought together to show prints produced by Haden along with those who inspired him such as Rembrandt and Dürer, Samuel Palmer and J A M Whistler. The RE has always been closely connected with the RA, with several Royal Academicians being founding members of the RE. Works showing by RA, RE members include: Christopher Le Brun, Frank Brangwyn, Henry Rushbury, Anthony Gross, Julian Trevelyan, Norman Ackroyd, Anne Desmet, Peter Freeth and Chris Orr. 2018 is also the 250th anniversary of the Royal Academy, making this a fitting time to honour this connection. By pairing modern and contemporary art with classical antiquities, this exhibition explores the ways in which Graeco-Roman art has captured and permeated today’s imagination. Demonstrating a crucially modern mode of classicism, Le Brun presents two sculptures and a painting, each a product of his engagement with the myth, history and poetry of ancient Greece and Rome. This major exhibition is staged across two spaces, the newly renovated Arcade of Bush House, and the Inigo Rooms in Somerset House East Wing where Le Brun’s work can be found. The New Art Gallery Walsall presents a major exhibition considering the legacy of J.M.W. Turner through the lens of contemporary art, highlighting the ongoing relevance of his work for artists practising today. With original J.M.W. Turner works loaned by Tate, the contemporary works come from: Dorothy Cross, Idris Khan, Christopher Le Brun, Cornelia Parker and Bob & Roberta Smith. Showcasing the finest historic and contemporary castle artists and combining history with art, Capture the Castle: British Artists and the Castle from Turner to Le Brun at Southampton City Art Gallery is the first ever large-scale art exhibition on the subject of British castles. It conjures the mystique, excitement and prestige of the castle from Iron Age hill forts to Victorian reproductions and fantasy castles. It will include famous and rarely seen works from public and private collections, including loans from Tate, The British Museum, V&A, the Government Art Collection and from the collections of major artists. Turner, Girtin, Cotman, Ibbetson, Sandby, Varley and many others travelled to castles throughout Britain in the search of the Picturesque. Castles, often sited in spectacular locations, were the perfect subject for the Romantic movement of the early 19th century that embraced the heroic past. Castles have been equally inspiring to modern-day artists and the exhibition includes work by over 25 contemporary artists. A fully illustrated book accompanies the exhibition, which has been generously sponsored by the Punter Southall Group. Now Turn the Page features a selection of new oil paintings and mixed media works on paper. 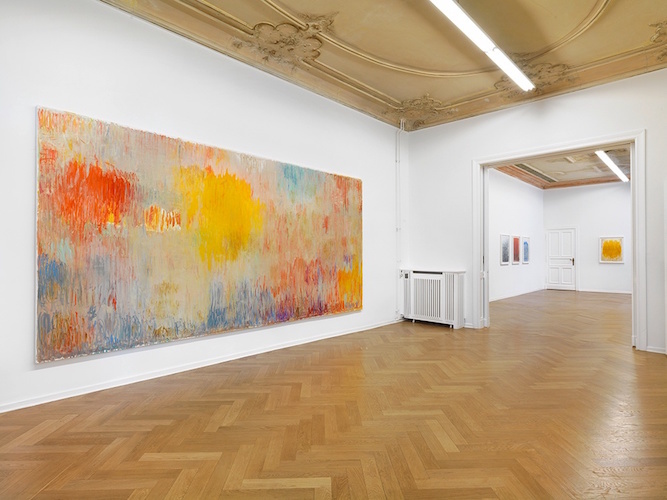 Having exhibited extensively throughout Europe and the United States, the show represents Christopher Le Brun’s first solo presentation in Berlin in almost a decade. Coinciding with Berlin Gallery Weekend and open throughout May. For the gallery site please click here. The second of the major two-part solo exhibition of new work shown at Albertz Benda, concurrent with the exhibition at The Gallery at Windsor, Vero Beach. Opened by Dame Jillian Sackler and with a conversation between Sheena Wagstaff, Chairman of Modern and Contemporary The Metropolitan Museum of Art, and Le Brun. For reviews of this exhibition please see the Press page. The first of a major two-part solo exhibition of new work The Gallery at Windsor, featuring a new book commissioned for the exhibitions by Windsor Press and a lecture event with the Artistic Director of the RA, Tim Marlow over the opening weekend in Florida. Composer is a body of work drawing from the parallels Le Brun draws between painting and music. Towards Night delves into the many interpretations and representations the night throughout art history. Artist Tom Hammick curates an exhibition that draws together paintings and prints that invite the visitor to experience a journey into a world of wonderment, insomnia and revelry. Towards Night includes works by J.M.W. Turner, Caspar David Friedrich and Edvard Munch alongside contemporary artists such as Peter Doig, Christopher Le Brun and Phoebe Unwin. during the past 18 months. A monumental sculpture, MARO, was made from Nestos marble for this exhibition at Chatsworth House in Derbyshire. The work is for sale and is in an edition of 3. Christopher Le Brun and Enzo Cucchi. New bronzes and oil paintings will feature in this two man exhibition, alongside a collaborative ceramic piece.